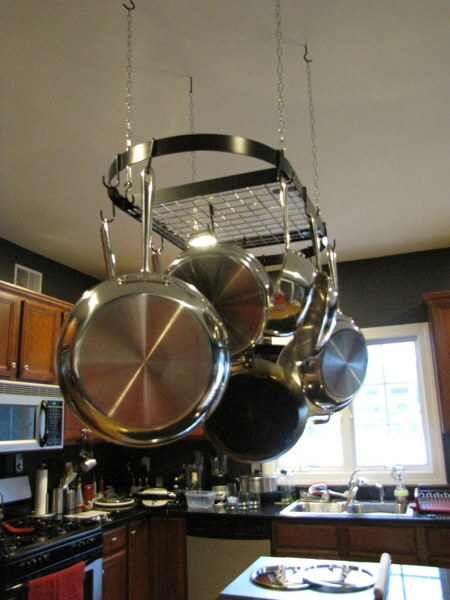 I Have a Pot Rack! Adam installed this in our kitchen ceiling yesterday, and I’m crazy excited about it. We have a ginormous kitchen, but the cabinets are so disorganized and overflowing. It makes me crazy since I like things to be orderly. But this rack freed up a cabinet and a half of space, so this week I’m not attempting to wrangle the kitchen into shape. It’s hard work, I’ve been at it all day today. I’m still not done, not even close. But when I’m finished, it will be glorious.